There are growing analytics of how online commerce businesses are riding to the sky. The internet now seems to be a new source of shopping and deals with a very easy purchasing procedure for anyone looking to shop online. Just enter your plastic money details to make the transaction and there you have the product in your doorstep in the next few days or so. Merchants see the web as a great medium to sell items on the go and so the resources and tools required in this medium to build a new online store can be provided by e-commerce softwares. We recommend Shopify – the best ecommerce software on the web to build an online shopping store with a great ease to create and manage everything on this platform and within your shop. Talking about the start and growth, Shopify was founded in 2006 with a team of 5. It started when the team was to sell snowboard equipment to its customers, but they get in need to have a separate store to exist as their brand name to deal in ecommerce instead of listing their items on marketplaces and so they built their one own. Soon they realized other stores too in need of starting their online retail businesses like them, but without any easy platform, they were unable to do so. Keeping that in mind, the team then launched Shopify, a platform to easily create a web store with all the resources in one solution required to run their businesses. Now Shopify is a team of over 500, working in 4 offices across Canada. It has 175,000 active Shopify stores with $10 billion worth of sales, as described in Shopify about page. It is pretty simple to create your first store on Shopify. You just need to pick a plan according to your needs and then the software lets you manage your goods, customize your storefront, accept credit card payments, track orders and respond to them. All the plans include a trial period of 14 days free of cost prior to your actual plan so that you may know all the things inside Shopify. Simply enter your email address, password and store name to start. After you purchase a plan according to your needs, you need no further installations of any kind. You only have to customize your layout, edit or create custom dimensions to some areas, add your goods, manage their details, maintain your entire store and leave else to the Shopify hosting team. They do the server management and upgrading the system softwares themselves. Manage your customer orders and see them grow with time to say in general. You have full control over the appearance of your store, plus you can select your design from over 100 ecommerce templates by going to their themes store. Add any type of goods to sell through your store. It can be from any physical item like apparel or furniture to digital services like educational courses or softwares. In your backend admin area, you can add your product details like SKU, their features, and more along with the content on your blog posts within your store. You can give the customers the option to pay you through credit card payments integrated with over 70 payment gateways including Paypal. Some of the major includes Visa, Mastercard, and American Express. The hosting team will equip your website with an SSL certificate and PCI compliancy, so there is no problem with payments plus there would be an increased trust to your online retail business by the search engines. As you pick up a plan, you will automatically $100 to advertise on Google Adwords. This is an added bonus to you, sent as a gift from Shopify to you for being their partner. Shopify provides an end-to-end solution for anyone looking to create an online retail store, so it has many features, or to say all the features required to create ecommerce. Professional looking design, with customizable templates, provided free to use with your account. Complete control over your HTML and CSS. Media assets connected to your every product and your whole site. A very organized CMS to do anything in your backend area with ease. Inventory tracking for your selected items. Drag and drop of product images. Multiple variants to use for your products with unique prices and weights. Use keyword tags to help customers search accurately. Option to avoid shipping by yourself. Make use of supported services like Amazon. New order updates deliver to you by email, RSS, and mobile SMS. Contact to the customers from within Shopify. Tracking status for payment and delivery with detailed reports. Export your orders in CSV format to use in your spreadsheets. Order cancellation with automatic cash back. Admin area includes tabs on orders, products, customers, reports, discounts, online store, point of sale, social media, buy button, mobile app, facebook store, apps, and settings. One-click submission to Google product shopping search engine. Can create deals of any kind like coupon codes, free shipping, discounts, etc. An XML sitemap is provided to you. Developed with Ruby on Rails web framework. Hosting is done on secured Debian Linux servers, protected by OpenBSD firewalls. Make your store perform better by monitoring your dashboard for traffic, sales and orders with deep insights. Look at which items are selling and which are not. You can integrate with Google Analytics to view visits and referrals. Find your customers sources and from where they come to your store. It is a very important part of organizing an ecommerce website to take analytics into consideration and know how you perform. It gives you that details of your site that you cannot find without it and those details in some way decide your store’s future performance. Shopify ecommerce solution is made to serve only for online retail businesses and so their hosting servers provide you all those things that are required by this type of website. You get unlimited bandwidth, so you never have to worry about the amount of traffic coming to your store. The store’s data of products, orders, inventories are backed up every day in their secured data centers. Your store would possess a 256-bit SSL certificate to keep the privacy of your business and your customers. 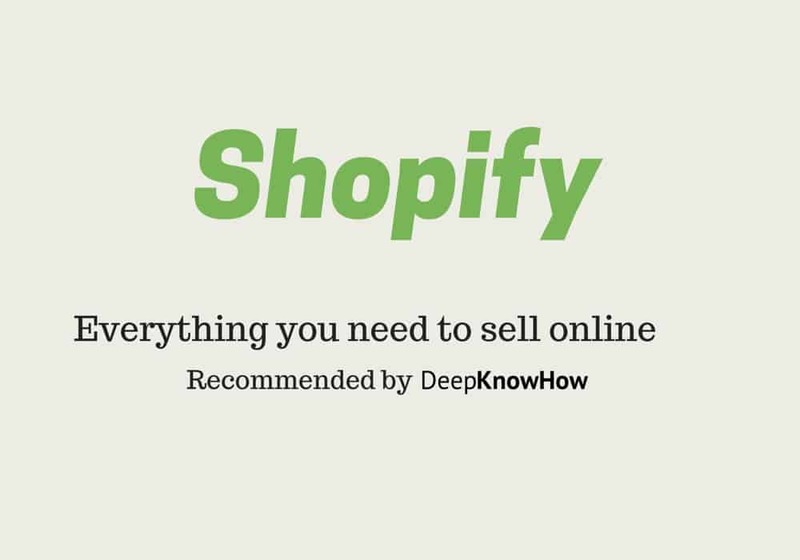 Shopify knows the right SEO needed for its ecommerce stores. An XML sitemap is automatically generated for the products, content pages and blog posts. Engage customers to leave user reviews by them for an added SEO benefit to that product. These all things contribute to the site’s SEO, making it easy for search engines to list your store above all. For marketing, notify your buyers of upcoming products, cross-sells and new discounts through Mailchimp email service app. Open your online store on Facebook and turn your visitors and page fans into buyers without leaving Facebook. It is equally easy and possible to use mobile to manage your retail business, process orders, get payments and send updates of shipping. Buyers can use mobile checkout to order items by visiting the mobile version of the site. Shopify mobile is a free app to manage site anywhere and anytime. See reports on your mobile dashboard. Edit your product details like pricing, inventory, or description right from your mobile. You can also contact the customers, calling them to their numbers. There is full compatibility of mobiles with the store as all the data is synced between the two. Increase the productivity and extendibility of your online store by using great apps developed to serve ecommerce on the app store. There are both free and paid plugins to get. Taking an example of ‘Better coupon box’, which is a free plugin that can be used to popup a coupon box that is likely to convert visitors into buyers or social followers. It has its own features and sales on Shopify store. Having Facebook and Pinterest in the list of selling across social media, Shopify now adds Twitter to that list. By adding Twitter, this host becomes the first ecommerce platform to provide sellers to sell across these 3 major social media platforms. Twitter has recently launched Buy Now buttons to test first with large merchants, but now it becomes available to small and medium-sized sellers with the help of Shopify. Followers can click the Buy Now button to view the product options and then enter their payment and shipping details to buy that product. As this is done, the order details appear on your admin area, just as any other orders on the online store frontend. This feature is an added bonus for twitter shoppers to buy on Twitter than to visit the store from the Twitter link. The Twitter tab on site’s backend lets you tweet your product on your Twitter sales channel. That tweet will automatically have the Buy Now button. Shopify is an all-in-one complete ecommerce package that is a great value for merchants looking to manage their inventories, process orders and ship without any hassle. It assures quality in everything it manages, and in terms of pricing it is worth of its value, as it provides you from unlimited hosting to plugins of every kind. A great thumbs up to Shopify! Try Shopify free trial for 14 days without any credit card required and experience it now. This article was published in Internet and tagged Business, Ecommerce, Make Money Online, Shopify.